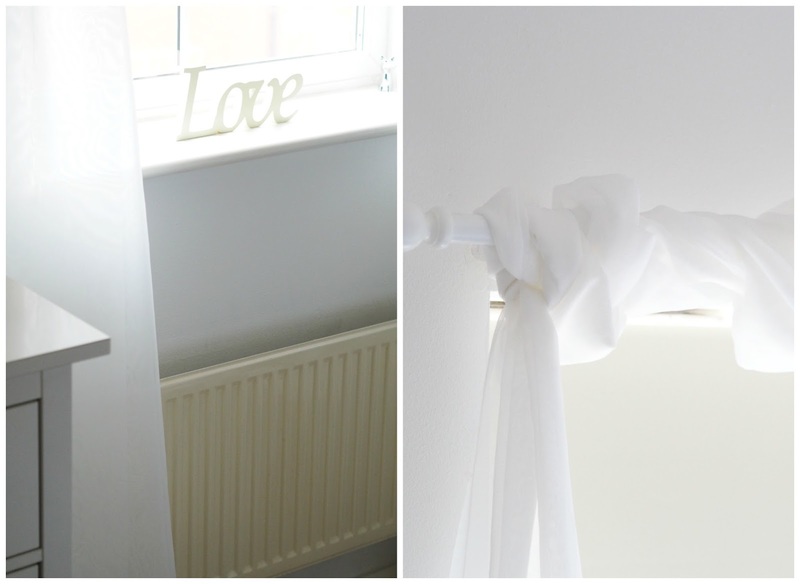 Last year I shared our master bedroom makeover (post here- please excuse slightly dodgy photography though!) 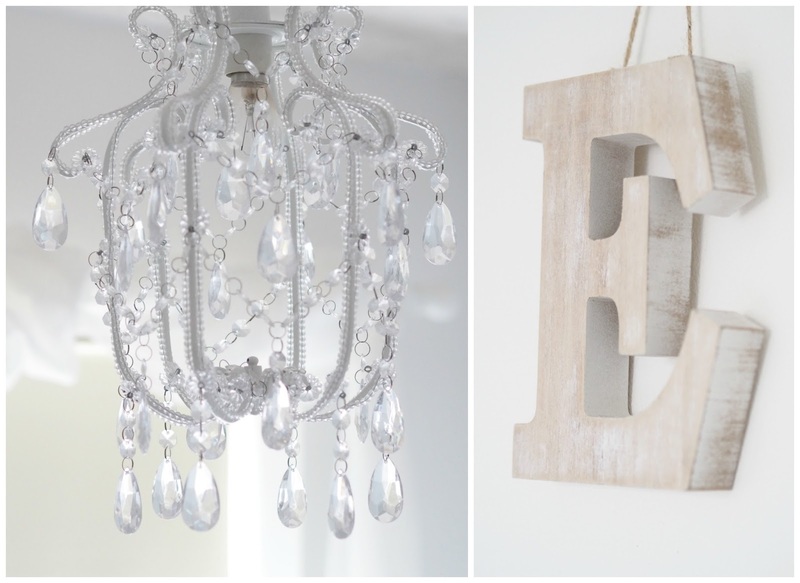 and now I bring you Emily's bedroom makeover. 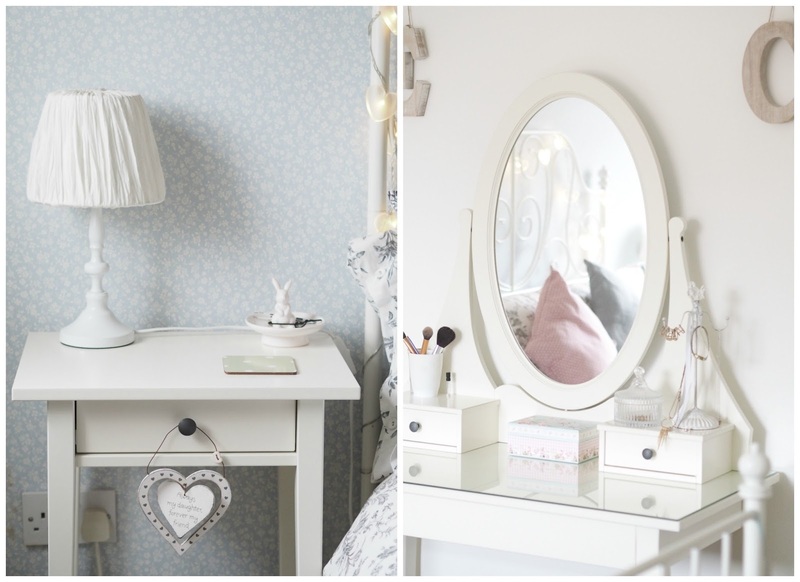 Prior to the makeover her room was that of a typical teenager and the revamp was long overdue to be fair. 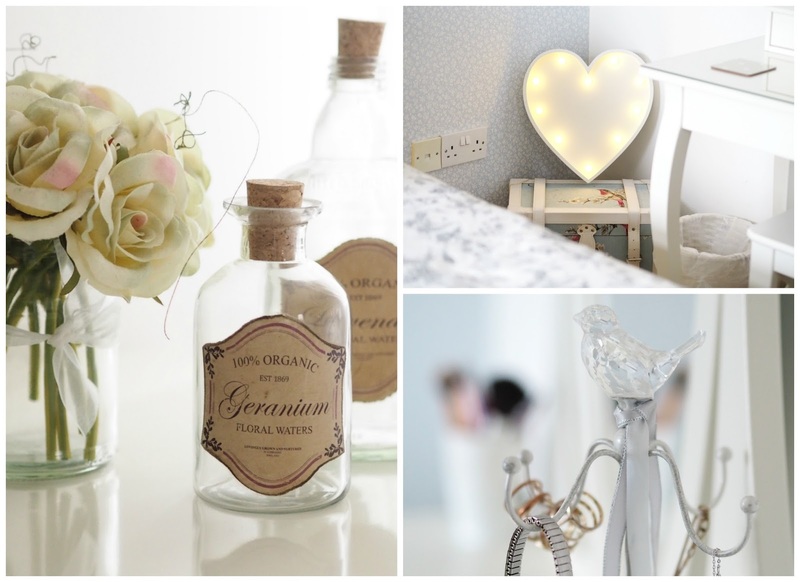 She wanted something along the vintage lines, feminine with pastel shades but really light and bright, she only has a small window in her bedroom so we wanted to make it as bright as possible. It took her a while to decide on the wallpaper (for one wall) as lots were big flowers or just too in your face and too much. 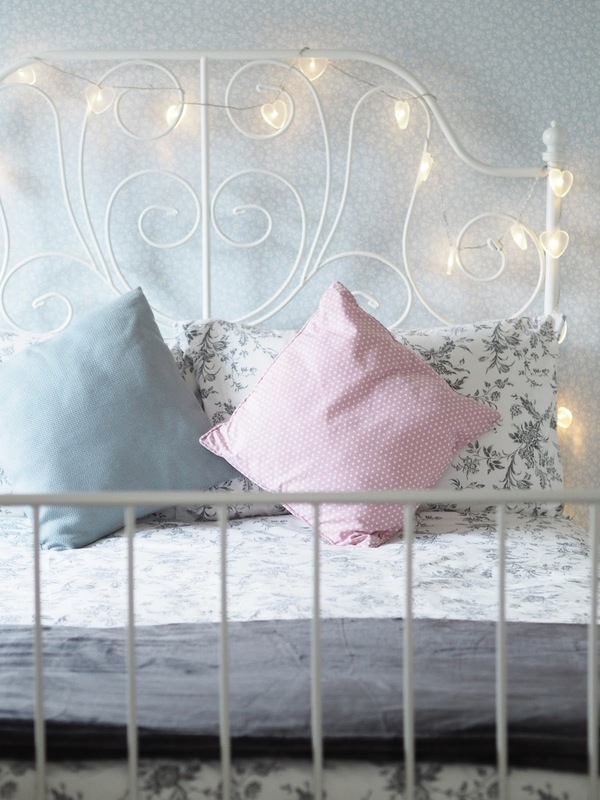 After having many samples blu tac'd all over her wall we settled (together) on this light blue number with tiny delicate white flowers, it was perfect. It was around £10 a roll but we only needed three. In fact Mr C and I were so damn good at hanging the paper we got away with only using two rolls!!! #A-TEAM. The paper was so easy to hang, it's one where you paste the wall rather than the paper itself and it went up like a total dream. DIY SOS eat your heart out! Mr C and I work really well as a decorating team although Mr C does all the cutting as I tend to cut rather wonkily (if that's a word?!). The other walls were painted white. We were working to a tight-ish budget but Emily needed new furniture and a bed so off to good old Ikea we went where we knew our pennies would stretch that little bit further. We chose a pretty white bed frame, it had to be white to fit the theme, and this one (here) was a great price. We also got this mattress to go with the frame. 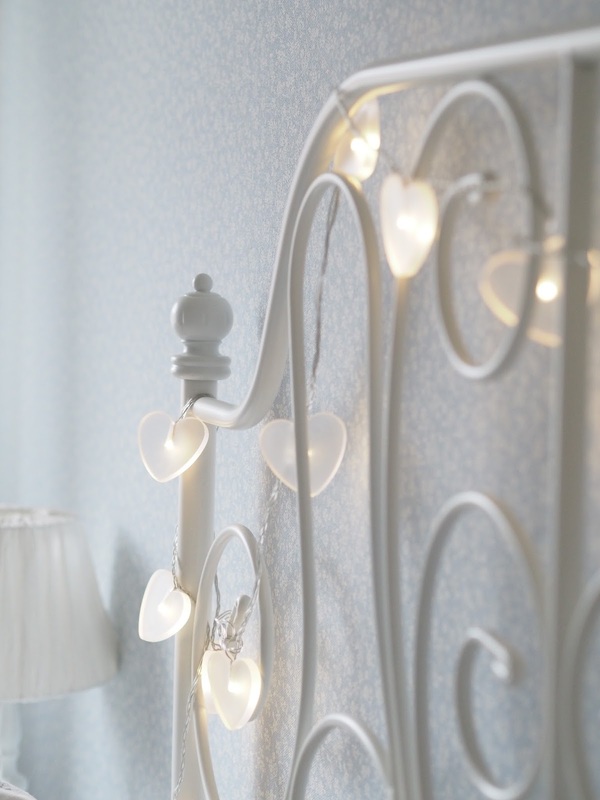 She wanted some fairy lights to go around the bed and she fell in love with these acrylic heart shaped ones, also from Ikea. I can only find red ones to link to but they may have the clear in store? 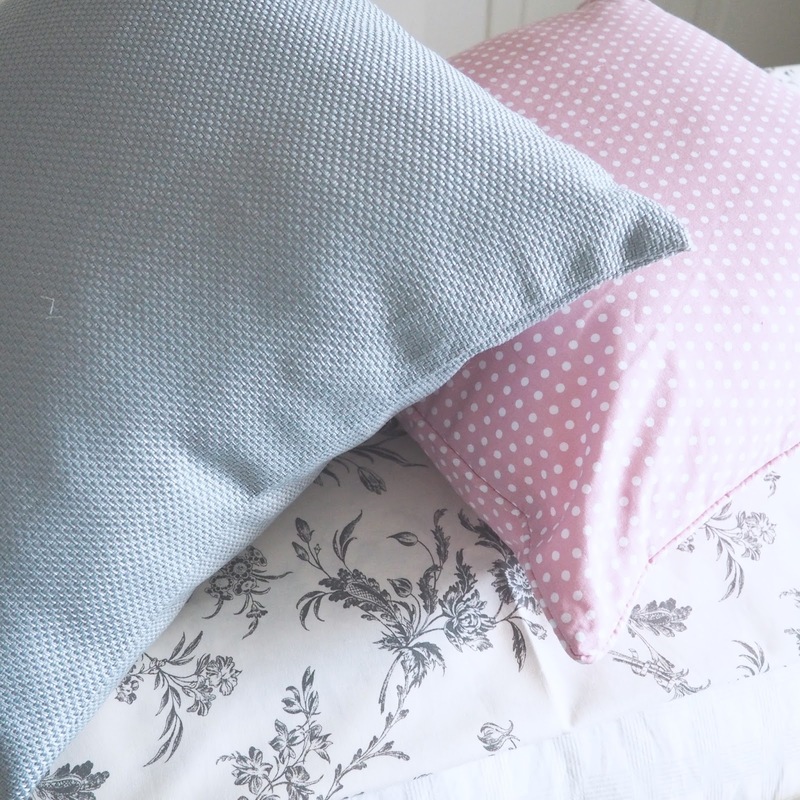 The gorgeous vintage style duvet cover is from there also and is such good quality. It adds that bit of contrast but blends in so well. 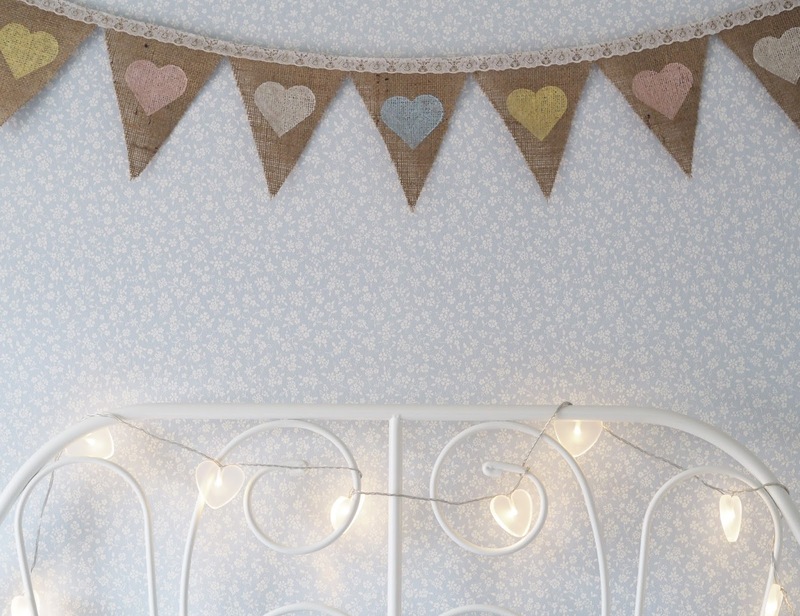 The delicate pastel bunting above the bed was made by my talented cousin who has been running her own wedding company. 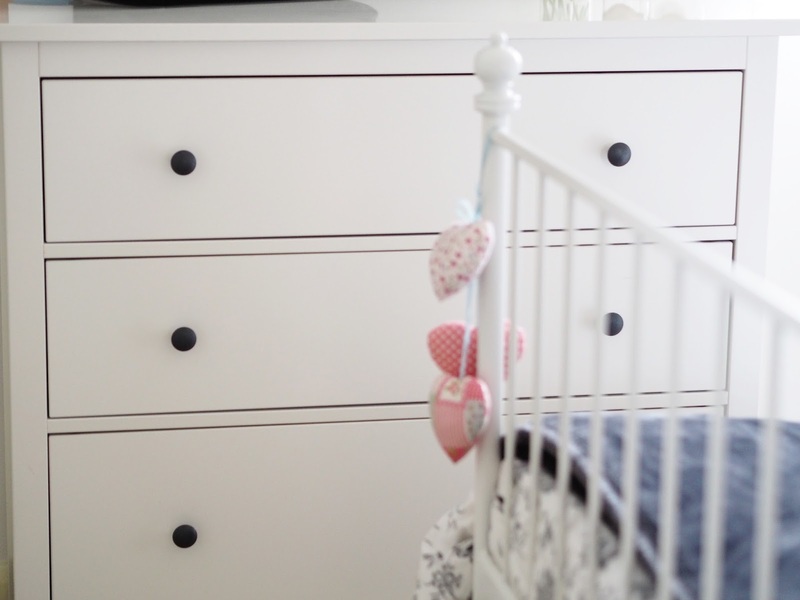 The furniture we chose was from the Hemnes range and was really the only one that fitted with Emily's vintage theme, everything else was just too modern. The dressing table is elegant and stylish and has three drawers for storage, two small ones on the top and one large drawer underneath. 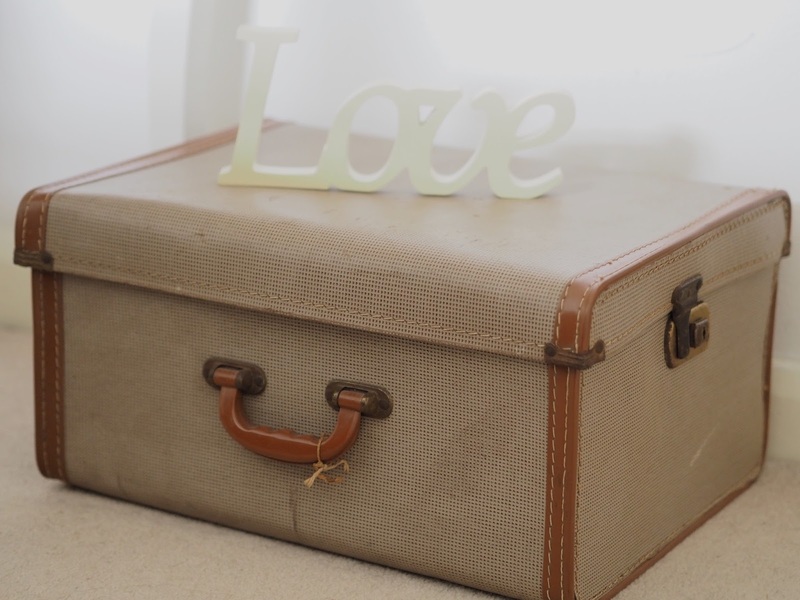 The chest of drawers offer a lot of storage too and are very sturdy. The bedside table completed the look nicely. (All items are linked). We didn't need to buy a wardrobe as Emily has them fitted. We put a roller blind up at the window in a subtle shade of lemon and I knew that curtains just would not go. I wanted voile, it would be just the thing to dress the window. 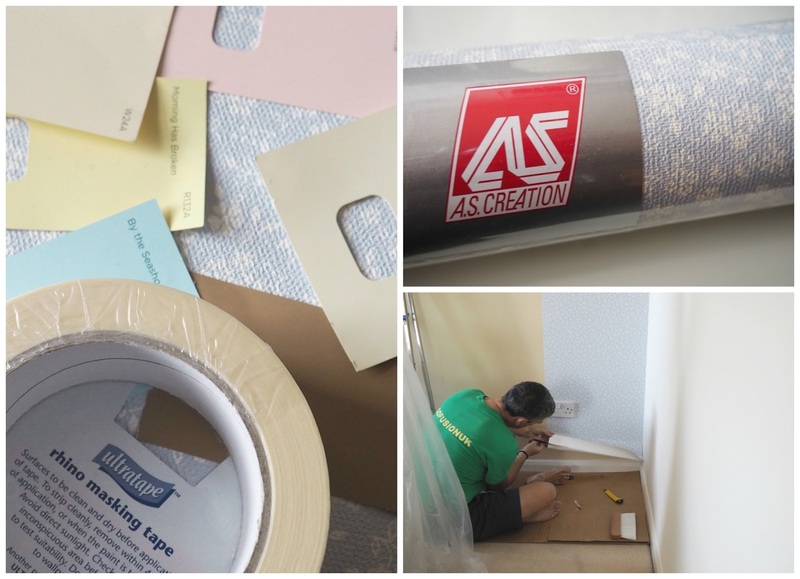 I bought in excess, can't remember how many metres, but I needed lots as I had this vision of it wrapping around the curtain pole and pooling onto the floor, in a romantic fashion. It took me a while to get it exactly how I wanted it, I'm such a damn perfectionist, I get on my own nerves sometimes! But, it's perfect and really does finish the room off. 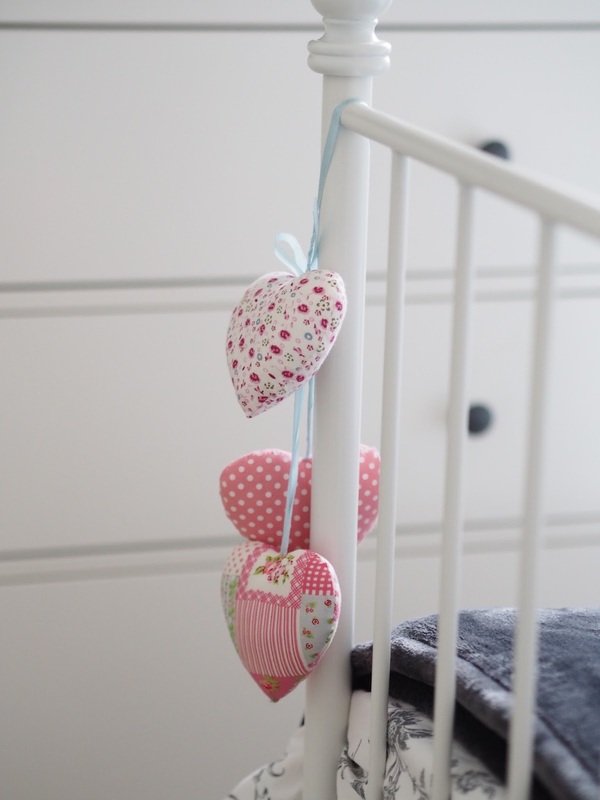 The total for the bed, mattress, furniture, and duvet cover came in at £499, which is the amount we had in mind but that doesn't include the cost for decorative items to dress the room, light fittings, blinds, voile etc. 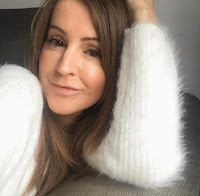 Sorry it's a bit of a long one and I've had to break it down into individual shots as I can't get a great deal of the room into one picture but hopefully it will give some of you a bit of inspiration if you're up for revamping a room anytime soon. I'd love to hear your thoughts on what we've done with this room. 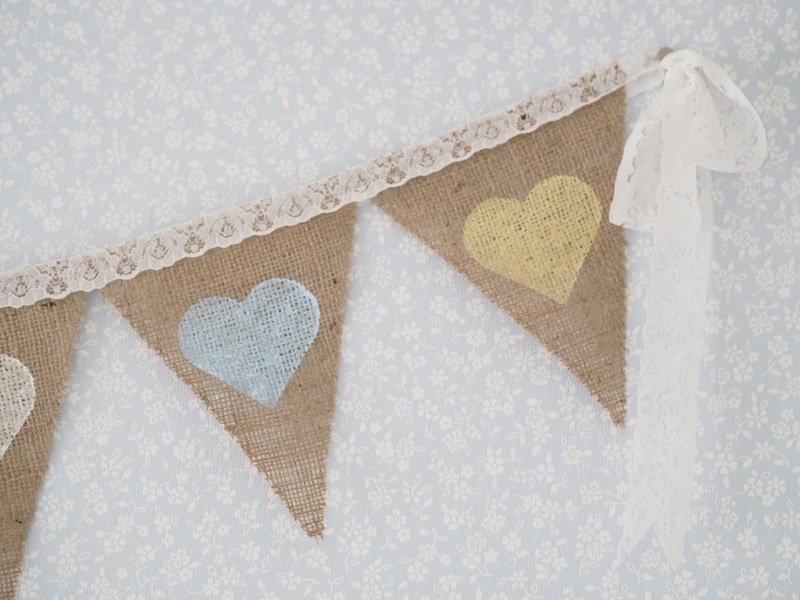 Do you love a bit of interior design/decorating? Looks lovely! I love the hemnes range in ikea! Cheers lovely, you can't go wrong with hemnes! Thankyou Jasmin, we were chuffed to bits with how it all turned out and the wallpaper is actually my favourite bit! This looks great Mrs ... fancy coming and doing mine! We keep attempting but dont get very far.